Everyone knows that money talks. 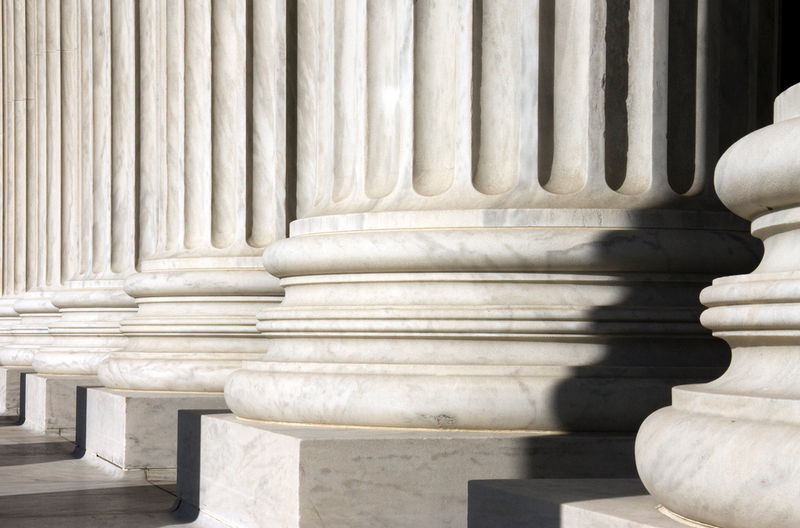 But today, the Supreme Court made it official: political donations are speech. Therefore, they ruled, the right to free speech guaranteed by the First Amendment applies to them too. And that means removing the limits. It is both cynical and accurate for the Court to have acknowledged that money is the single most important part of our political system. Still — in the most immediate sense, a post-McCutcheon world might not seem different at all. The very wealthiest, most determined donors have long since become experts at finding ways to see money funneled to their candidates of choice. They simply may now act directly, rather than finding back doors through the process. As the 2014 campaign season grows more heated heading into November’s midterm elections, though, we will probably see the ripple effects of today’s ruling start to spread out. The ruling lets stand existing Federal Election Commission limits on donations to individual candidates and political committees, but removes caps on the total amount a person could donate to all candidates and committees. Click for full-size chart. The McCutcheon ruling does not change the maximum size contribution that an individual is allowed to make to a candidate’s campaign. That number remains fixed at $2600 per candidate per election. (A donor may contribute toward the primary and also again toward the general election.) What vanished today is the cap on total election contributions, limiting how much cash any one donor can pump into the entire system per election cycle. Lifting the limit on total contributions allows an individual donor to spread the wealth, as it were, and spend his or her cash on many more candidates. 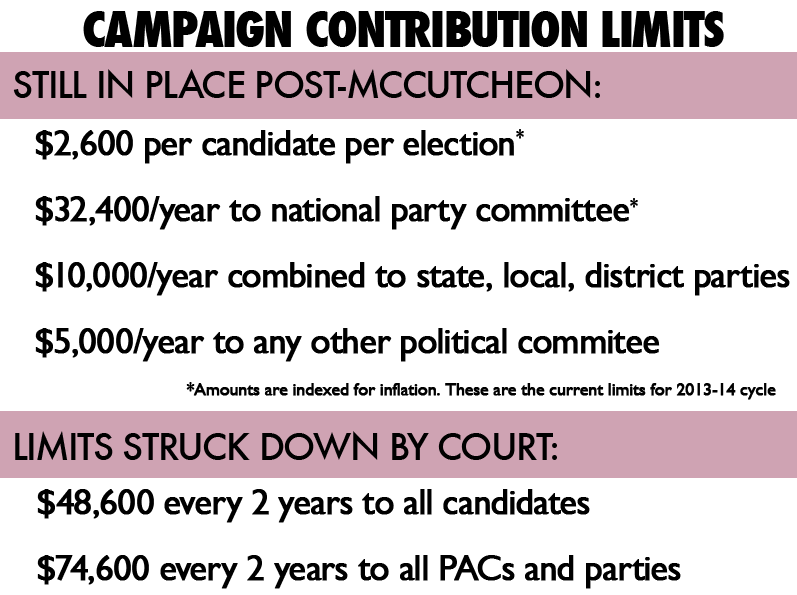 That’s what McCutcheon, who filed the initial suit, wanted: to send contributions well under the limit ($1776, because of course) to a couple of dozen candidates during the same election cycle. Because of the aggregate limit, he couldn’t. Now he can. How much money would a big donor donate if a big donor could donate money? Mr. McCutcheon does not have many peers: in terms of specifically who can do specifically what with their money, today’s ruling affects a vanishingly small number of people. The Center For Responsive Politics estimates that 0.4% of Americans ever donate more than $200 to political campaigns, and 0.1% of them ever give more than $2500 in a single donation. In the entire country, only 591 donors ran into the aggregate giving limit during the 2012 campaign season, “accounting for only $34.1 million of the estimated $3.1 billion” raised and spent. The rest of that $3.1 billion didn’t exactly come from other, smaller-scale individual donors, though. Crowdfunding might be the major zeitgeist of 2014, but there’s only so far it can get you. If 50,000 donors can find $10 each to give, that’s a huge number of donors! And it’s also only half a million dollars. A solid million donors giving $10 each is still only $10 million. Most of the big money comes from the business world and the people in it. 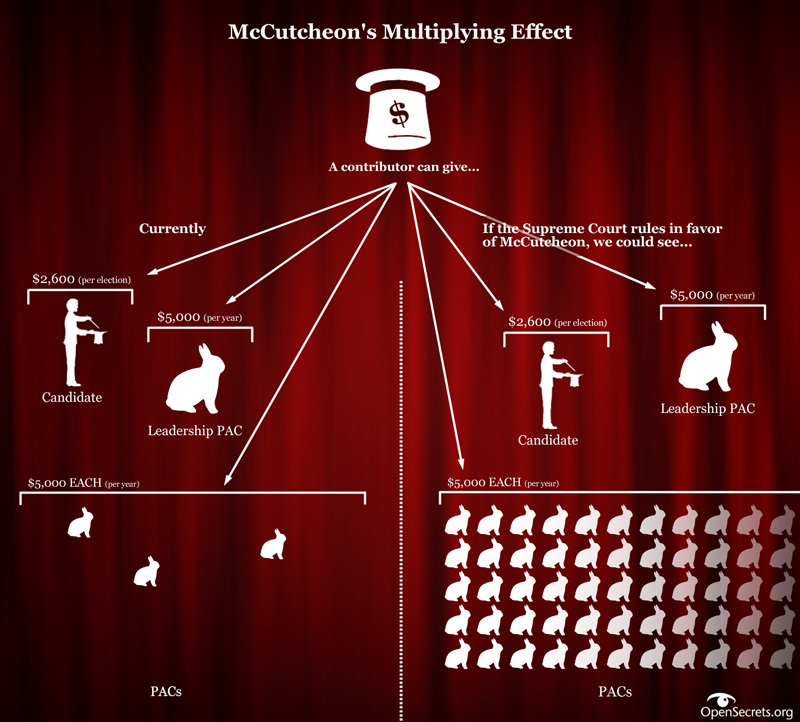 So if individual donations are just a (large) fraction of overall funds raised, why is McCutcheon such a big deal? The danger in the McCutcheon ruling lies not so much with the aggregate donations to particular candidates. In many races, $2600 is comparatively small potatoes and a few extra donations of that size scattered around probably won’t change the system all that much. The danger comes from the other limit that was lifted: the cap of $74,600 in donations to the kind of political action committee that can give money to candidates. And there’s no secrecy there: if John Smith gives $5000 to the Political Party National Committee, everyone knows it. And when the Political Party National Committee then turns around and cuts a check for $5000 to the Jane Doe re-election campaign, most people can effectively connect the dots. Now, without an annual limit, a donor can contribute to as many of these organizations as she or he wishes, just as that donor can contribute to more candidates. And that can have a much deeper or broader effect. Chart explaining the multiplying effect, via OpenSecrets.org. And now that a donor can cut $5000 checks to as many PACs as they can find, there’s no reason for there not to be a hundred different committees working specifically toward re-electing Jane Doe. The lucky fictitious Mr. Smith can now donate to them all. The ludicrously wealthy don’t donate to political campaigns because they like someone’s tie collection. Those donations are an investment — one from which they expect a return. If John Smith got rich running a logging business, he probably doesn’t want the law to change in favor of tree conservation. So he’s going to support candidates who don’t plan to focus on environmental regulation — and if there’s a candidate around who supports repealing environmental regulations, he thinks, even better! He can, however, choose not to donate to the incumbent again if that representative does start voting in favor of environmental protection. And he can take that money that the incumbent was counting on and donate it to the primary in favor of the other guy instead. Campaigns are expensive; elected officials prefer to keep their biggest donors happy. Every writer and commentator who has mentioned the McCutcheon ruling today has said “Citizens United” in the same breath, and with good reason. In the wake of the Supreme Court’s 2010 ruling in that case, anonymous corporate campaign contributions skyrocketed. When SCOTUS gives permission for more money to enter the political game, it happens. Immediately. Five or six hundred individuals in the whole country got permission slips to change their behavior today. That’s not very many people at all. But what matters most is not just how many of them there are, but who they are, and how they act. Behind every one of America’s worst companies stand many of America’s wealthiest men and women. And unlike John Smith above, they aren’t fictional. They have very real agendas they want to advance, to benefit both themselves and their businesses. Comcast, for example, has already been greasing government palms ahead of pushing its merger with Time Warner Cable through the federal approval process. If high-ranking cable executives can slip a few hundred thousand or a few million here and there to their special friends in DC, now there’s no limit on their influence. Or in other businesses: the Walton family still owns over 50% of Walmart, and Walmart has a vested interest in almost everything. They’re a key agitator for or against regulation in labor laws, building, manufacturing, imports, sales of items like guns and tobacco… they’re a behemoth. Surely, individual Waltons have bent more than a few individual ears in the House and Senate, and would undoubtedly like to develop even more influence with targeted lawmakers where possible. In the end,the line between the regulators and the regulated is a thin and dotted one. Businessmen go into politics; politicians leave Washington and go back into business. Every last one of them wants to know who their friends are when rules need bending. Campaign finance laws recognize that large money contributions can break that chain. When money calls the tune, those ideas, representing the voices of the people, will not be heard. Next Comcast Cruises Past Verizon, Walmart Upsets Bank Of America In Worst Company Quarterfinal Action! Next Up: Comcast Cruises Past Verizon, Walmart Upsets Bank Of America In Worst Company Quarterfinal Action!